It’s no secret that one of the main drivers of cancer is us becoming overweight. It is bad enough that the fat stomachs, love handles, and big thighs and hips are not attractive, but the fat inside of the body is the real problem. A key to preventing disease is to keep your body composition…your muscle and fat ratio at a healthy level. Although most of us easily recognize when we are overweight, there is another hidden type of fat that is not so obvious called visceral fat that can only be detected with body imaging such as an MRI scan. 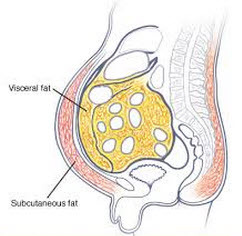 Visceral fat is fat on the inside of your body…under your abdominal muscle. Subcutaneous fat is found just under your skin and is noticeable while visceral fat may be present it is not noticeable. However, visceral fat is more dangerous than subcutaneous fat because it can surround vital organs like your liver and heart hindering their proper function. And, being slim doesn’t excuse you from this dangerous fat. Even slim and normal weight people have it. This “internal” fat is particularly dangerous, aggressively changing the hormonal and chemical balance of the body. It is metabolically active and associated with higher levels of certain hormones, including estrogen, and higher insulin levels, which are linked to cancer. Belly fat is also dangerous because it releases toxic chemicals that produce inflammatory molecules that enter your bloodstream. High inflammation levels in your body can trigger a wide range of systemic diseases. These inflammatory changes accelerate and promote the growth and division of cells making cancer easier to develop and take hold. “Apple shaped” people who carry excess body fat in their mid-section have a higher risk of heart disease, diabetes and incur other health problems because of it. Your metabolism is your body’s engine and determines the rate your body burns fuel/calories. The health and condition of your muscular system determines the speed at which your motor is running. If you have weak, flabby muscles, they cannot burn up the fuel/food we eat and it gets stored both on the outer and inner parts of the body. Because of our modern day sedentary world it is unlikely that most people use their muscles as they have been designed to be used. Our muscles simply do not get enough work in our adult life. However you can recover much of that muscle tissue that has been lost and get your metabolic motor running faster than ever so it can burn off that belly fat. Only by increasing your muscular health can you change your body from a fat storing one that will threaten your health and possibly your life, to a fat burning machine. Once that fat burning machine is kicked in, not only will you lose the fat, but you will keep it off. Your appearance will be more youthful as your muscles firm up, get smoother, tighter and shapelier. You can kiss those saggy, flabby fat pockets good-bye. Your exercise program combined with healthy eating will help to bring your body weight back into a healthy range to lower the levels of circulating cancer-promoting chemicals and hormones and decrease your risk of ever getting cancer.